Hello long-lost friends! How are all of you? I apologize for having been MIA this week! I had something to do well into every evening after work, which means no blog posts for this girl : ( But the upcoming weeks will be much better, I think, and I'll be showing you lots of wedding projects along the way. 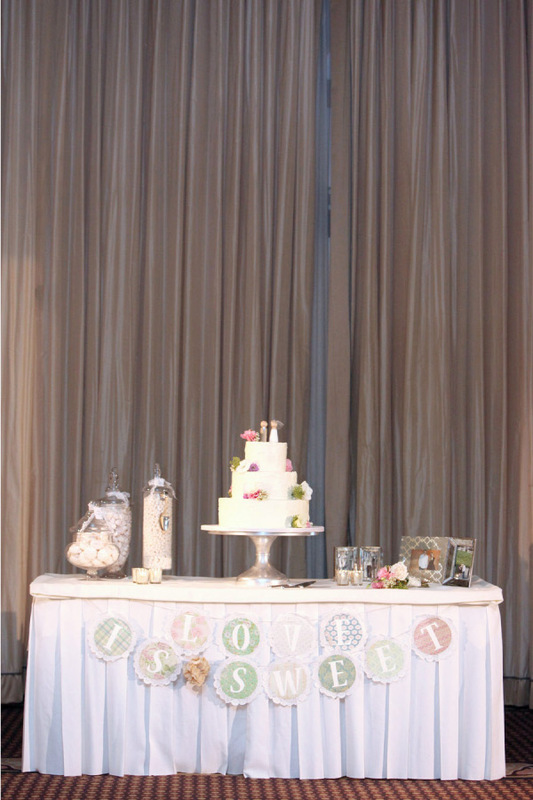 We will also have three apothecary jars filled with white candies, a small cutting cake, plus a cupcake tree for all our cupcakes, so it will be fairly similar to the above picture. I love it! I think it turned out so great! 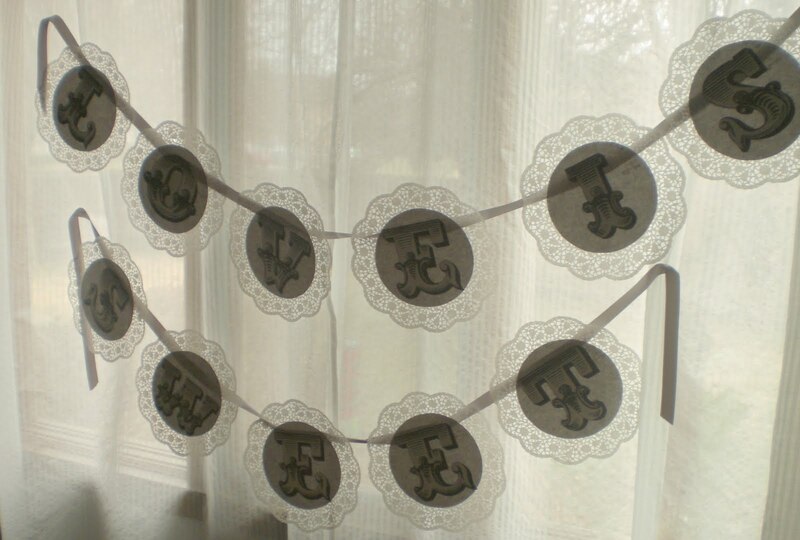 It will add just the right touch of vintage whimsy to our wedding. Want to make your own or something similar? It's super easy, I promise! 1. Measure the diameter of the inner circle of your doily. 2. 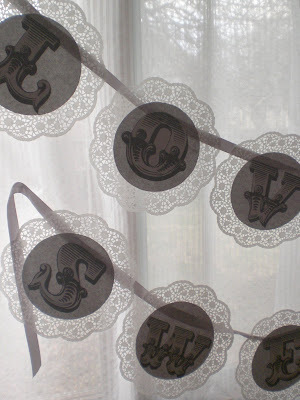 Using your compass, trace circles onto the scrapbook paper to fit inside the doilies. My circles needed to be 6.5 inches in diameter, so I set the compass to 3.25 inches and went to town. I got two circles per 12x12 sheet of scrapbook paper. 3. Choose your words and lettering. I used Romantiques font from dafont.com, which is my favorite free font site. 4. Create your letters on the computer, using a design program like InDesign (for you fellow graphic designers out there) or even Word. My letters were size 300 font, which made them around 4-5 inches tall. 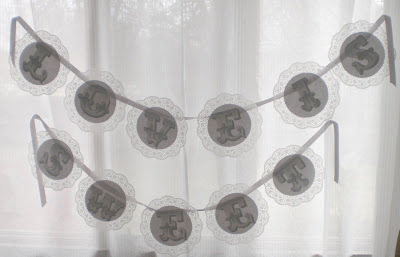 I printed each letter in gray (my main wedding color) on an individual sheet of cardstock. 5. Cut each letter precisely at its edges. I like the Romantiques font because its lines are thick and it's easy to read at a distance. 6. Once all your elements are ready, assemble each doily one at a time. I used a glue stick to glue on the circles/letters because I didn't want the edges to stick up. 6. 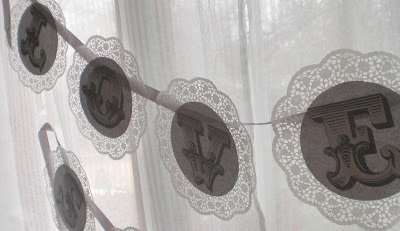 Place elmer's glue on the ribbon and press the back of the doily into it at the desired spot. I left a bit of ribbon on each end for hanging or to hang down from the banner. 7. Display! 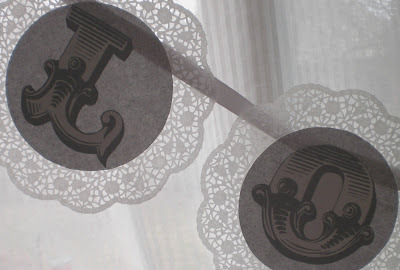 I used straight pens to hang mine, since at home and at the wedding it will be attached to fabric. See, I told you that was easy! Best of all, it's big impact for extremely low cost. I bet the whole thing didn't cost more than $3 or $4 in paper and doilies. It took me maybe a couple hours to put together, done over several days. What do you think? Would you think it was neat if you saw it at a wedding? I sure hope my guests will too! More wedding projects to come soon! I'm linking to Good Life Wednesdays at A Beach Cottage and Tuesday's Treasures at My Uncommon Slice of Suburbia. Go take a peek! They're the best parties on the block! It looks awesome, Courtney! Your wedding is going to be so beautiful! Your's sure is cute! Looks like a beautiful wedding in the making! So sweet and lovely! Can't wait to see more wedding "stuff!" Fabulous work, my love!!!! These are beautiful! !